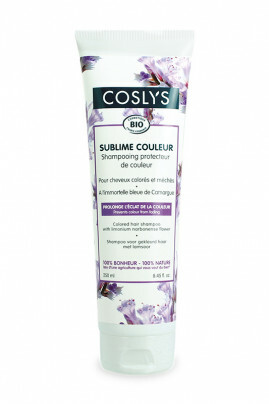 COSLYS Organic Shampoo Sea-Lavender protects and soothes color treated hair. Sea Lavender extract protects from UVA/UVB effects while Lavender vinegar makes your hair colour shiny and long-lasting. Coslys Organic Shampoo for Colored Hair leaves your hair smooth, shiny and easy to style with a 100% natural fragrance ! Coslys Organic shampoo provides long lasting vibrant colour ! Apply COSLYS Organic Shampoo with Sea Lavender on wet hair. Lather then rinse with clear water. For intense hair care, use Coslys Reparing Hair Mask for 2 to 5 min then rinse. Aqua (water), spiraea ulmaria flower extract* (organic meadowsweet floral water), sodium coco-sulfate (anionic surfactant from coconut), glycerin (natural glycerine), cocamidopropyl betaine (amphoteric surfactant from coconut), polyglyceryl-2 lauroate (lipidic agent from palm-kernel and coconut), coco-glucoside (anionic surfactant from coconut), glyceryl oleate (emollient from copra, sunflower oil and natural glycerin), hydrolyzed wheat protein, limonium narbonense flower/leaf/stem extract (sea-lavender extract), aloe barbadensis leaf juice powder* (organic aloe vera gel), sodium lauryl glucose carboxylate (anionic surfactant on sugar basis), lavandula angustifolia flower extract (lavender extract), rosmarinus officinalis leaf extract (rosemary extract), salvia officinalis leaf extract (sage extract), thymus vulgaris flower/leaf extract (thyme extract), tocopherol (natural vitamin E), coconut alcohol, lauryl glucoside (anionic surfactant from coconut and glucose), acetum (plant vinegar : lavender, rosemary, sage and thyme), sodium chloride (salt : thickener), sodium sulfate (foaming cleansing basis from coconut), dicaprylyl ether, lauryl alcohol (emollients), glycine soja (non GMO soybean) oil, potassium hydroxide (pH regulator), dehydroacetic acid (preservative agent), parfum (100% natural fragrance), benzyl alcohol, sodium benzoate, potassium sorbate (preservative agents), limonene, linalool (components naturally present in essential oils).